WASHINGTON – Six weeks after US President Donald Trump announced the withdrawal of American troops from Syria, the US-led coalition of 79 partner countries and organizations gathered in Washington on Thursday to assess the fight against ISIS and the situation in eastern Syria. At the meeting, held the day after his State of the Union address, Trump praised the Coalition's partners and the Syrian Democratic Forces for liberating "virtually all the territory previously held by ISIS." The confab took place as ISIS is largely defeated, having lost 99.5% of its territory, according to recent Defense Department estimates. US Secretary of State Mike Pompeo said 110,000 sq. km. of territory had been liberated and seven million people freed from ISIS control in the last four and a half years. He laid out the coalition's strategy going forward, saying the US is committed to Iraq's security forces, and to preventing ISIS threats to the partner countries. He encouraged every one of the 79 members to "put our money where our mouth is." This would include investing in "civilian stabilization assistance," the programs that would return areas liberated from ISIS to functioning and safe parts of their respective countries. "Our final objective is to promote justice for victims." Attendees included: Canadian Foreign Minister Chrystia Freeland, who posted a photo with Yazidi genocide survivor Nadia Murad; and Mevlut Cavusoglu, the Turkish foreign minister, who said that coordination was needed to prevent the resurgence of ISIS. "It takes addressing the root causes of this scourge effectively and avoidance of the repetition of past mistakes." Hanging over the generalizations and self-congratulatory remarks was the US decision to quit Syria. The US, which stressed the need for stabilization, did not lay out its plans for the future in eastern Syria or how its withdrawal would be managed. Germany's foreign office noted before the meeting that while ISIS had been "pushed back" in Iraq and large parts of Syria, the threat has "by no means been averted." Turkey stressed that Trump's decision to withdraw, announced in December 2018, was not the end of the conflict. "It simply represents a new stage in an old fight." The US has not articulated how it will manage or coordinate its Syria withdrawal. This has led to constant rumors about how it may play out. Reports last month indicated the US might remain at its base in al-Tanf in eastern Syria's desert. Turkey and the US have been discussing a "buffer" or "safe" zone that might extend up to 30 km. in Syria. Turkey wants this zone to be free of the People's Protection Units (YPG), the Kurdish group that it asserts is part of the Kurdistan Workers Party (PKK), but which is also part of the SDF, the main partner of the coalition. This has raised fears of a new conflict in Syria once the US withdraws. The co-chair of the Syrian Democratic Council (SDC), Ilham Ahmad, has been in Washington for two weeks giving talks and holding discussions aimed at slowing a US withdrawal and shoring up support for the SDF, of which her SDC is the political wing. She has met with groups across the political spectrum, including Democrat Tulsi Gabbard, who is running for President in 2020. According to Al-Monitor, she received an invite to the State of the Union address from Gabbard. Gabbard has been critical of US Syria policy, especially regarding the Assad regime, asserting Assad is not an enemy of the US. This leaves many question marks about the withdrawal. 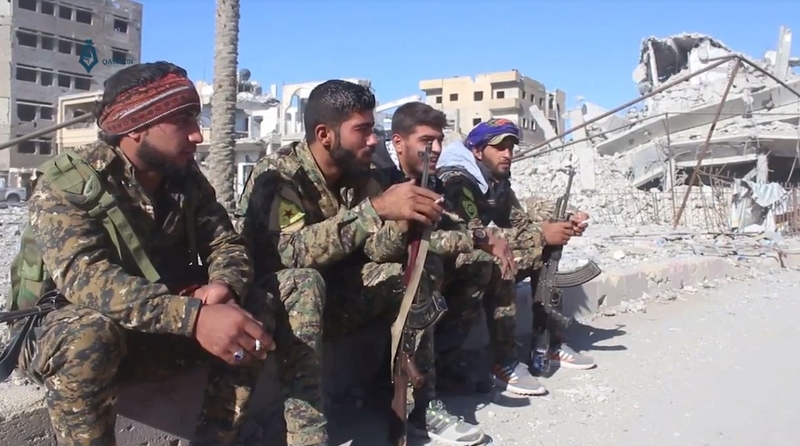 The SDF fears a quick withdrawal might lead to escalation in tension with Turkey which would force them to seek out a deal in which the Syrian regime might return to the border in eastern Syria, or Russia might broker some kind of deal. But they prefer the US partners they have worked with for four years to defeat ISIS. After more than 10,000 casualties fighting ISIS, the SDF and its constituent groups want peace. But the US hasn't provided clarity on what comes next, according to meetings held in Washington with individuals knowledgeable of the current discussions. At the same time, the US has hosted representatives of Egypt, France, Germany, Jordan, Saudi Arabia and the UK to discuss the situation in Syria. They emphasized the need for a political solution to end the conflict, but did not provide details. Turkey's Deputy Minister of Foreign Affairs, Sedat Onal, also was in Washington on February 5 and met with US officials to launch several working groups on bilateral relations, including "bilateral cooperation on Syria." As with the Coalition meeting and the other high level meetings held this week, no concrete plan for what comes next was made public. It appears that more than a month and a half after Trump made his withdrawal from Syria announcement, much remains to be ironed out. There has been pushback and recognition of the sacrifices the SDF made fighting ISIS. But the US has not yet made the SDF part of the larger discussions about the withdrawal, and the meeting of the coalition did not provide clarity on that move. The coalition's twitter account rarely seems to mention areas in eastern Syria which were liberated by the coalition. Instead, it mentions projects in Aleppo, Azaz, Souran in Hama province and UN programs directed to other areas of Syria. While the coalition said in December 2018 that "many stabilization projects had started in Iraq and Syria," and that humanitarian efforts will continue in 2019, it is no longer spotlighting those efforts. The online withdrawal seems to have already begun, even if the physical withdrawal is at an impasse.